Some Chinese miners taking advantage of the vagueness in the allocation of mining licences and the laxity of the administration in Cameroon are illegally engaging in semi-mechanized artisanal mining leading to destruction of the environment and many deaths. Sidonie Maboue pulls her hands out of the muddy water to nurse her eight-month-old baby. Sitting on a piece of multicolored fabric, she has filled three bags of gravel with five of her twelve children under a blazing sun. “These pebbles will be crushed, sifted and if you have the chance, you can find gold but it is difficult,” says the 45-year-old widow who sometimes earns 1500 F CFA, approximately $2.8, after several weeks of digging. Around her, a hundred people noisily search the yellow metal in a chain work at the Kaye craft quarry in Ngoe Ngoe, a village in the region of East Cameroon. Men dig the earth, crush the gravel and dry the holes with a motor pump. Women collect gravel from muddy waters or prepare food in a makeshift kitchen. The children have fun on the back of their mothers or sleep on pieces of cloth spread on the ground. 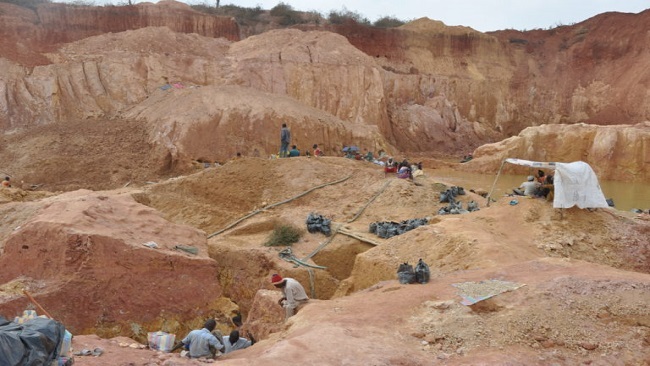 As in Ngoe Ngoe, artisanal mining of gold through the use of manual methods and processes draws crowds in several localities in the Eastern Region. But, the vagueness in the allocation of mining authorizations often creates conflicts between local gold miners and expatriates. According to the Mining Code of 2001, only craftsmen of Cameroonian nationality are entitled to an artisanal exploitation permit. In recent months, this exclusivity is threatened by the presence in the artisanal sites of Chinese operators who practice semi-mechanized artisanal mining through the use of mechanical shovels and loaders, gravel washing machines and chemicals. Semi-mechanized artisanal mining was conducted for the first time in Cameroon in 2007. In that year, the government had asked the South Korean company C&K Mining to conduct an operation to salvage some 13 tonnes of gold that was likely to be washed away by overflowing water from the Lom Pangar dam. The authorities knew that this decision violated the 2001 mining code, which does not recognize semi-mechanized artisanal mining. At the time, they used the emergency situation as justification. Later, this act by the government was capitalized upon by some unscrupulous operators who started semi-mechanized artisanal mining of gold. In December 2016 President Paul Biya promulgated a new mining code that recognizes semi-mechanized artisanal mining. However, this exploitation should be carried under Cameroonian law which states that the shareholding in the companies should have nationals controlling at least 51 per cent. This mining code could have helped to reduce the impact of the confusion around mining permits and the rehabilitation of mine holes. But, the decree implementing the new mining law is not yet signed by the Prime Minister. Meanwhile, semi-mechanized artisanal mining, although illegal, is already doing damage to Cameroon. In 2017, open and abandoned mining holes by operators of the semi-mechanized artisanal mine including Chinese left 50 people dead in the Ngoura, Betare Oya or Ngoe Ngoe communities in the East, according to NGO Forêts et Developpement Rural (Foder) calculations. This civil society organization reported that 250 mining sites opened between 2012 and 2014 have not been rehabilitated by operators of the semi-mechanized artisanal mine. It therefore, launched an online petition to get the Ministries of Mines and Environmental Protection to intervene. In a video published by Foder on the dangers of illegal mining, a farmer tells how Chinese gold miners grabbed her land and destroyed her plantation with excavators. “The Chinese entered my field and started mining gold without my permission,” says Philiphine Boh. “The Chinese told me that it is the authorities that sent them and they will give me 70,000 F CFA ($ 131.2) for compensation. I said that this money is insignificant for a field of one hectare that they spoiled. Currently, I have nothing left,” said this mother of five. The local populations are often surprised by the Chinese presence in the mining sites. They wonder how these expatriate operators were allowed to exploit the gold on their land. The Center for Education, Training and Support to Development Initiatives in Cameroon (Cefaid), an NGO based in Yokadouma in the Eastern Region, reports that some local elites are signing secret deals with Chinese miners. In addition to corruption, some Chinese in their greed for gold do not care about taxes. After the death of nine people in Ngoe Ngoe, some local NGOs and media reported that the site in which the tragedy occurred was operated by the Chinese company called “Lu and Lang”. Yet neither the reports of the local branch of the Extractive Industries Transparency Initiative (ITEI) nor the tax services know the name of the company responsible. The local official in charge of mines in the East refused to comment on this accident, indicating that this file is being handled by his bosses. “This company is not registered in our books,” says a source at the Ministry of Mines. “No Chinese company has obtained a semi-mechanized artisanal gold mining license in Cameroon,” the source said. In fact, this fictional company is the initiative of lady Lu, an economic operator of Chinese nationality, who did not wish to comment. After Ngoe Ngoe, she and her employees moved to Colomine, another mining town in eastern Cameroon, where they continued to mine gold at a site guarded by soldiers. “The mining sector is a mafia,” concludes Victor Amougou. “This crime unfolding before our eyes does not benefit either Cameroon or Cameroonians, perhaps an elite who would have received 5 or 10 million CFA ($ 9,376 to $ 18,755)”.